How Do I Optimize My Media Mix & Improve ROI? Multichannel marketing has become the norm today. Brands need to be omnipresent as media consumption fragments and consumers take control of where, when and how they will choose to interact with a brand. Marketers struggle to make sense out of a plethora of data in an attempt to create competitive advantage in an ever more complex advertising and media consumption landscape. This presentation will explain in layman’s language what it takes to create a testing and analysis environment that yields reliable results that can be used to continuously improve ROI. Topics covered will include what basic principles of in-market testing experimental design, customer segmentation, choosing the right metrics for assessing success by individual digital media channels, assessing test results, and perhaps most importantly, determining what portion of total lift should be attributed to each channel or medium. Such attribution analysis is critical to a marketer’s ability to optimally allocate precious budget dollars to individual media based on their individual financial returns. 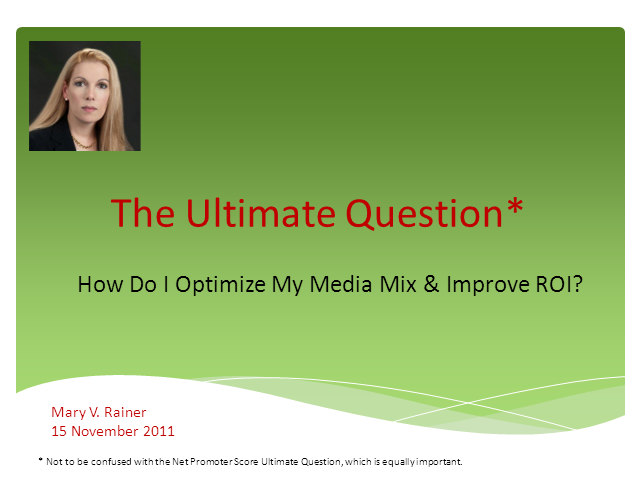 Title: How Do I Optimize My Media Mix & Improve ROI?